This is a large area within modern Pembrokeshire comprising good mainly pastoral agricultural land, between Eglwyswrw, to the south, and St Dogmaels on the Teifi estuary. A number of burnt mounds, of possible prehistoric date, attest to early occupation in the area, as do several Bronze Age round barrows on the high ground at the north end of the area. During the historic period, the area (with the exception of a small area at the far east end) lay within the medieval Cantref Cemaes, in Is-Nyfer commote, in the division of Uwch Clydach. Cemaes was brought under Anglo-Norman control in c.1100 by the Fitzmartins who retained it, as the Barony of Cemaes until 1326, when they were succeeded by the Audleys. The Barony was coterminous with the later Hundred of Cemais, which was created in 1536, but many feudal rights and obligations persisted, some until as late as 1922. 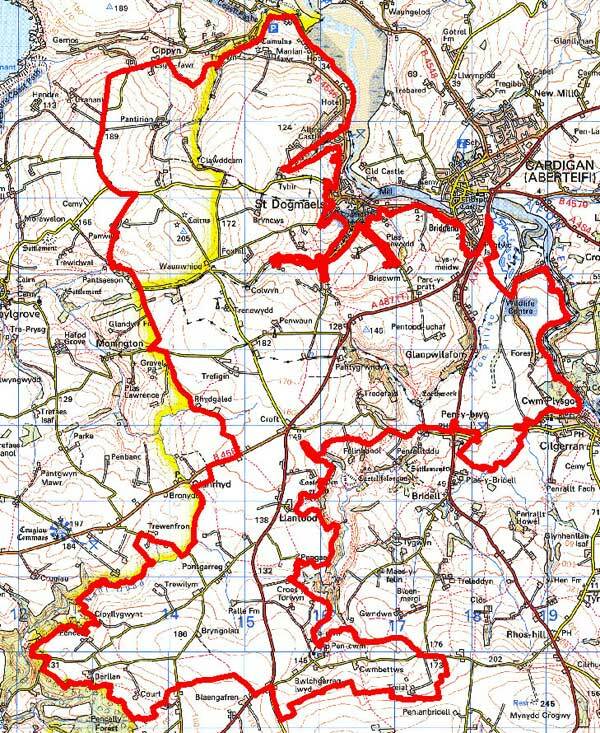 This character area lies within Eglwyswrw, Llantwyd, Monington and St Dogmaels parishes. Eglwyswrw parish was coterminous with the manor of Eglwyswrw which was held from the 13th entury onwards as a sublordship of the barony, comprising one knights fee. It maintained its own manorial court ‘baron’ every 15 days and a biannual court leet. However, its early post-Conquest history is vague. Pengelli Forest, just east of this area, which was always part of the manor, could have provided its original name, as a ‘lord of Pengelli’ was recorded before 1231. It may even have early medieval origins - a study of deserted rural settlement sites by Sambrook has identified seven potential settlement foci within the sublordship of Eglwyswrw, that, perhaps correspond to Jones’ model of an early ‘multiple estate’. By the time Cemais was recaptured from the Welsh, in 1204, the Cantingtons appear to have been lords of the manor of ‘Eglwyswrw’. It reverted to the Audleys, via a female heir, in 1326 and was henceforth held in demesne by the lords of Cemaes, and in the 16th century, was in the inheritance of the Owen lords of Henllys. The original caput of the sublordship of Eglwyswrw, originally in the village, was later re-established at Court Farm, a moated site 1km to the northwest, and at the southern end of this character area. It was in ruins by the 16th century but ‘huge walls’ could still be seen. It appears to have become a mere tenant farm at an early date. Eglwyswrw’s importance as an economic centre is illustrated by the fact that, in the 16th century, there were four markets and fairs within Cemaes, three of which were held at Eglwyswrw, and the manor was responsible for levying the militias of the Hundreds of Cemaes and Cilgerran. It was included in the detailed assessment of 1594 that survives as the ‘Extent of Cemaes’. Welsh systems of tenure appear to have persisted throughout the sublordship, with the subsequent development of a number of small landholdings. Each of these was associated with a gentry house of varying status, but by the 16th century the landholdings had mainly become amalgamated under the Owens of Henllys. Among those listed in the ‘Extent’ were the present farmsteads of Trewilym, traditionally a seat of the 13th century Cantigtons, and Berllan which also had medieval origins. Both were later owned by the Owens of Henllys. The sublordship also inclused farmsteads of later establishement, such as the 17th century Tredefaid. The parish of St Dogmaels was coterminous with the manor, which comprised one knight’s fee held as ‘St Dogmaels patria alias Cassia’, of the barony by the abbots of St Dogmaels. At the dissolution, it passed to John Bradshaw who had purchased the abbey in 1543. The Manor of St Dogmaels survived into the 19th century. It had been acquired by the Neuadd Trefawr estate during the 17th century and was sold to David Davies of Castle Green, Cardigan, in 1862. Manian Fawr, at the north end of this area, may be the site of an early earthwork castle. It was part of the manor and later became a gentry-house. The Manor of Monington was also held of the barony. Not being ‘parcel’ of the barony, the manors of Monington and St Dogmaels were not included in the ‘Extent of Cemaes’. Llantwyd was not a manor at this time, and reckoned only as a vill. However, it has a fine motte-and-bailey castle, which is perhaps a re-used hillfort, at ‘Castell Pen-yr-allt’, although without a recorded history, it shows signs of having been fortified in stone. It lies within 400m of Llantwyd parish church, and the two may be contemporary Anglo-Norman institutions. It appears, therefore, that Llantwyd was an early manor that ‘failed’. It is now a farm. The church was rebuilt in the 19th century, immediately to the north of its predecessor. There is some common land throughout the area, but it is associated with village rights, as at Eglwysrwrw, rather than relict. It is apparent that the entire area was settled, and probably enclosed with the present system of regular fields, by the early post-medieval period. The tithe maps of the 1840s show the landscape much as today. The character area has been crossed by the main Haverfordwest-Cardigan route since the medieval period, which was later turnpiked and is now the B4329. The Fishguard-Cardigan route (A487T) is of similar age to the B4329 .Although industry is never a major factor in the development of this landscape, there was some small-scale lime production. Its overwhelmingly agricultural character is relieved along its western edge by the Whitland - Cardigan railway line, which was incorporated in 1869. The line - which gained a place in local affections and was nicknamed the ‘Cardi Bach’ - was operational until the 1960s, mainly conveying milk and holiday traffic to Cardigan and St Dogmaels. However, these developments have had little effect on the settlement pattern which remains chiefly dispersed. 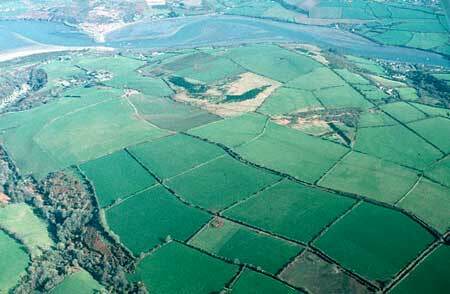 This is an extensive historic landscape character area lying on the southern bank of the Afon Teifi. Although most of this landscape lies across gentle slopes with a general north-facing trend down to the tidal river, some steeper slopes lie in tributary streams valleys. Higher hills risie to over 200m above sea level. 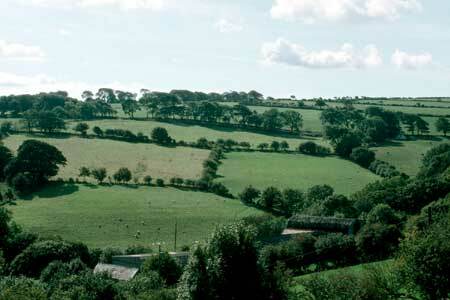 It is an agricultural character area dominated by medium-sized fairly regular fields and dispersed farms. Fields tend to be larger and more regular on higher ground and smaller and more irregular on lower-lying land. Apart from pockets of rough ground along the floor of the Piliau valley, land-use is almost entirely improved pasture with a very small amount of arable. There is some deciduous woodland and a little coniferous plantation on some of the steeper slopes, but apart from these locations woodland does not strongly characterise the area. Hedges on earth banks divide the fields. Hedges are generally well maintained, but thinner, and more straggling at higher altitudes, and more lush and overgrown in sheltered locations. As noted above woodland is not a feature of this landscape. However, in a few locations such as close to Pantirion farm substantial trees have grown in the hedges. Lower Teifi valley slate is the main pre-20th century building material, with north Wales slate commonly used for roofs. On the better quality 19th century buildings the Teifi valley slate is cut and coursed, but used as uncoursed rubble pre-19th century structure and poorer quality houses and farm outbuildings. It is left unrendered on farm buildings but smaller houses are frequently cement covered. Although the building stock dates mainly to the 19th century, minor gentry houses of the 17th and 18th centuries such as the listed Tredefaid demonstrate that stone was the principal building material in earlier periods, at least for major buildings. There is a wide range of 19th century social-economic groups represented in the buildings. Georgian styling in most houses is a uniting element in the buildings stock, from substantial early 19th century houses such as the listed Parc y Pratt to the more common simple later 19th century farmhouse in the typical southwest Wales style – two storey and three-bay with a central front door and five symmetrically arranged windows. A very good example of this is the listed Glanpwllafon farmhouse. Houses with stronger vernacular traits, including single-storey houses with attached, in-line farm buildings are present, but are not as common. Close to Cardigan and St Dogmaels there is a scatter of 19th century worker houses. These mostly date to the later 19th century and as with the farmhouses most have strong Georgian style traits, but a few have clear vernacular elements. There is also a scattering of modern housing, again with a concentration towards Cardigan and St Dogmaels, with some clustering as at Briscwm. Most farms are large. Tredefaid has a late 18th century farm building, but as with the houses the majority of the older farm buildings date to the 19th century, and mostly the second half of that century. The large, formally arranged stone farm buildings at Parc y Pratt are typical of a gentry house. Usually one or two ranges of stone outbuildings are present, with extensive modern concrete, steel and asbestos buildings on most working farms. Owing to the numerous modern farm buildings some of the older stone structures are disused or have been converted to other uses. There is a large number (over 120) and wide range of archaeological sites, including Bronze Age round barrows, a hillfort, early medieval inscribed stones, medieval defended sites, Llantwyd parish church and numerous post-medieval quarries and other sites. Apart from the scheduled Bronze Age round barrows, which are found on the highest points, few of these sites help characterise this area. This is not an easy historic landscape character area to define apart from along its northern boundary where it meets the Teifi estuary, St Dogmaels, Cardigan and Cilgerran. Elsewhere there is a broad zone of change between this area and its neighbours.